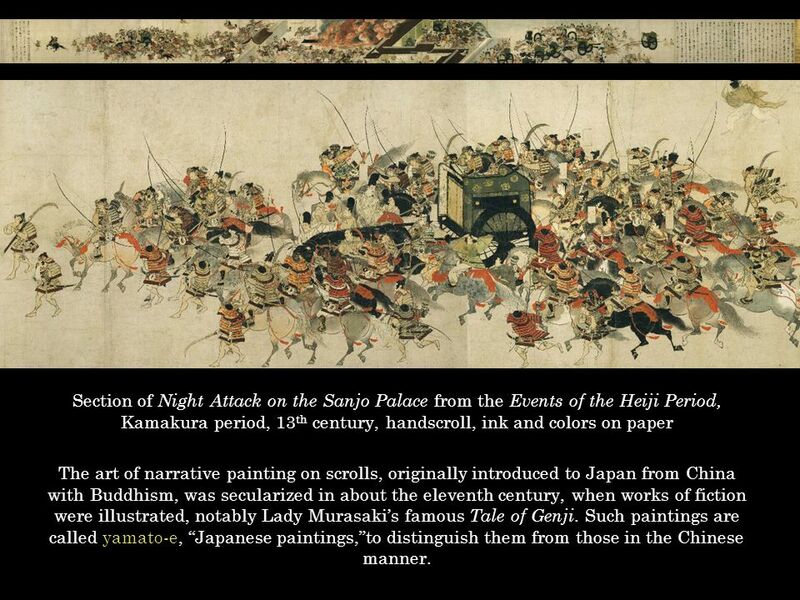 3 Section of Night Attack on the Sanjo Palace from the Events of the Heiji Period, Kamakura period, 13th century, handscroll, ink and colors on paper The art of narrative painting on scrolls, originally introduced to Japan from China with Buddhism, was secularized in about the eleventh century, when works of fiction were illustrated, notably Lady Murasaki’s famous Tale of Genji. Such paintings are called yamato-e, “Japanese paintings,”to distinguish them from those in the Chinese manner. 4 The detail below is part of a scroll set that grew out of the nobility’s interest in the recent past; it is the Heiji monogatari emaki, dated to the second half of the 13th century. The tale deals with the events of 1160 that led to the defeat of the Minamoto clan at the hands of the Taira. So decisively were the Minamoto put down that it took the clan twenty years to rebuild to the point of successfully challenging the Taira again. One of the most dramatic episodes in the Heiji Rebellion is the burning of the retired emperor Goshirakawa’s Sanjo Palace. 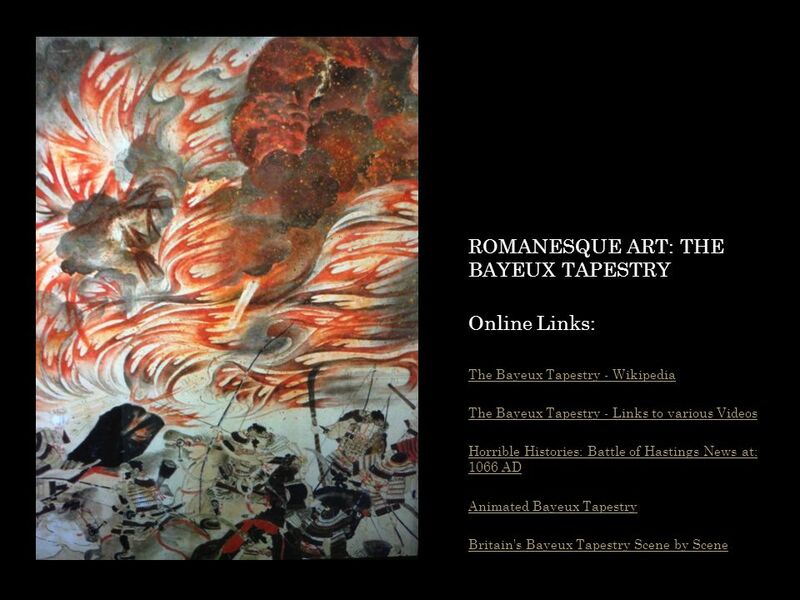 The emaki (picture scroll) depicting this phase of the uprising is owned by the Museum of Fine Arts in Boston. 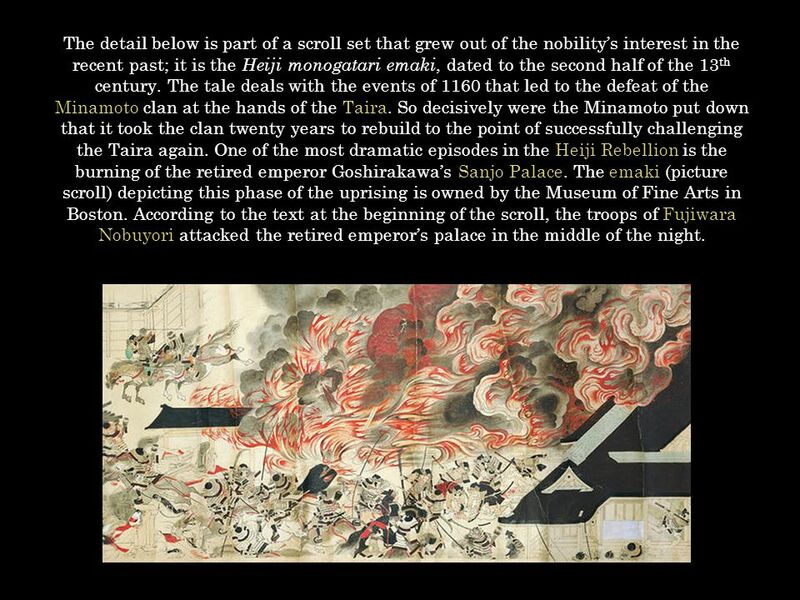 According to the text at the beginning of the scroll, the troops of Fujiwara Nobuyori attacked the retired emperor’s palace in the middle of the night. 5 In the night of December 9, 1159, the Sanjo palace was taken by storm and the ex-emperor Goshirakawa made a prisoner in a sector of the imperial palace. The scene begins with a bustle of carts bringing noblemen and their valets to the palace at the news of the nocturnal attack. 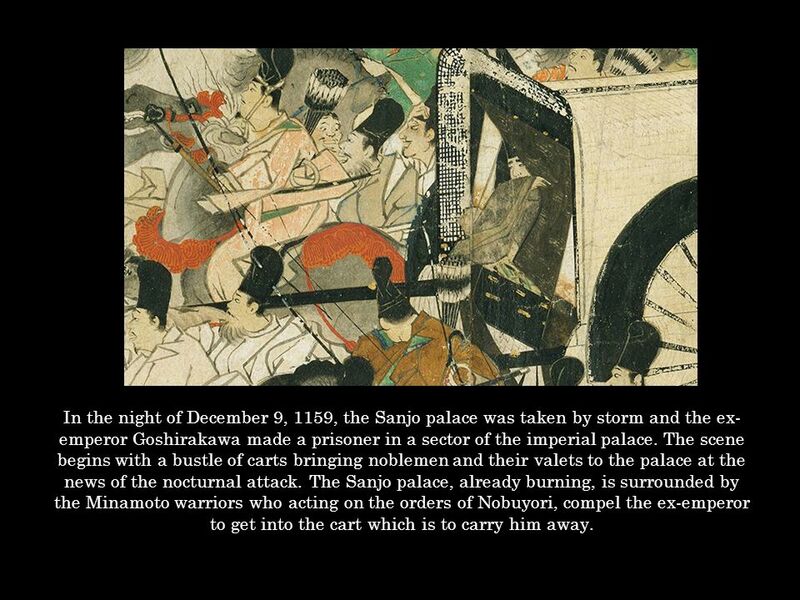 The Sanjo palace, already burning, is surrounded by the Minamoto warriors who acting on the orders of Nobuyori, compel the ex-emperor to get into the cart which is to carry him away. 6 The text preceding the painting conveys only the bare bones of this drama: “Soldiers blockaded the [Sanjo] Palace on all four sides and set fire to it. Those who fled out they shot or hacked to death. Many jumped into the wells, hoping that they might save themselves. The ladies-in-waiting of high and low rank and the girls of the women’s quarters, running out screaming and shouting, fell and lay prostrate, stepped on by the horse and trampled by the men. It was more than terrible. No one knows the number of persons who lost their lives.” The artist is like a stage director taking his cue from these few sentences. The episode is extended horizontally in one long, uninterrupted flow of action composed with cinematic skill. Meech, Julia. “Reflections on Fenollosa and the Heiji Battle Scrolls.” Orientations, Vol. 21, No. 9. Sept 1990. 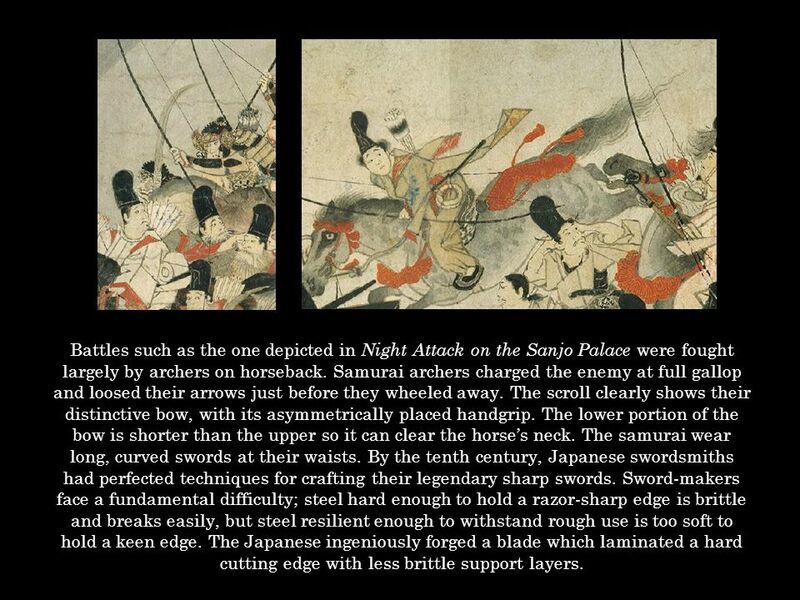 7 Battles such as the one depicted in Night Attack on the Sanjo Palace were fought largely by archers on horseback. 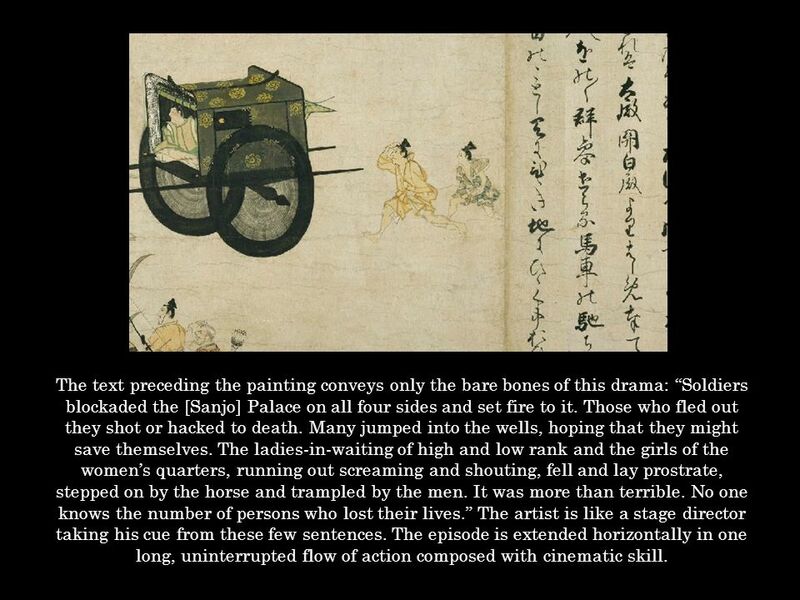 Samurai archers charged the enemy at full gallop and loosed their arrows just before they wheeled away. The scroll clearly shows their distinctive bow, with its asymmetrically placed handgrip. The lower portion of the bow is shorter than the upper so it can clear the horse’s neck. The samurai wear long, curved swords at their waists. By the tenth century, Japanese swordsmiths had perfected techniques for crafting their legendary sharp swords. Sword-makers face a fundamental difficulty; steel hard enough to hold a razor-sharp edge is brittle and breaks easily, but steel resilient enough to withstand rough use is too soft to hold a keen edge. The Japanese ingeniously forged a blade which laminated a hard cutting edge with less brittle support layers. 8 Within the palace walls, there is bloodshed on all sides; imperial guards beheaded, courtiers hunted down and killed, ladies-in-waiting drowned in a well, as they flee distractedly from the fire, or trampled to death by fierce warriors running amuck. The horrors of war are delineated uncompromisingly, as seen through the eyes of an objective, realistic-minded artist. 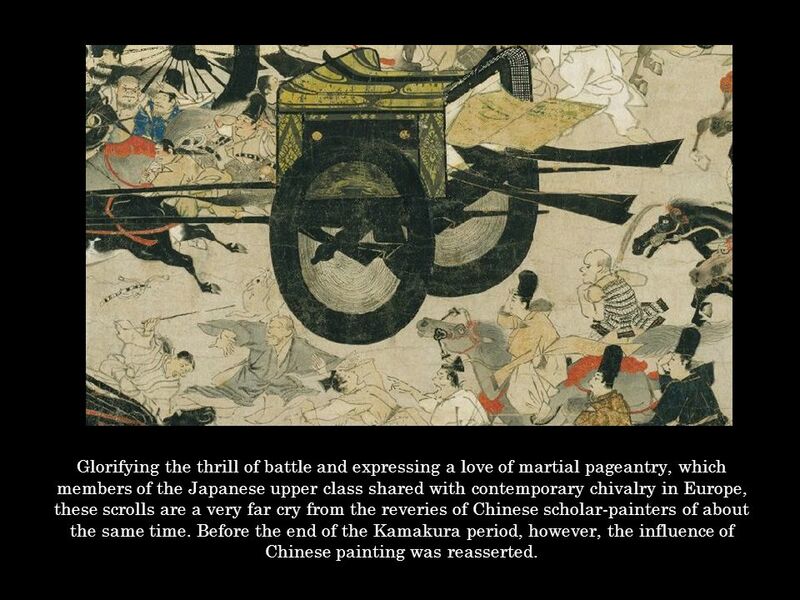 9 Glorifying the thrill of battle and expressing a love of martial pageantry, which members of the Japanese upper class shared with contemporary chivalry in Europe, these scrolls are a very far cry from the reveries of Chinese scholar-painters of about the same time. Before the end of the Kamakura period, however, the influence of Chinese painting was reasserted. 11 Originally these scrolls may have belonged to a set of fifteen, perhaps paired with a now-lost illustration set of fifteen Tale of Hogen scrolls. 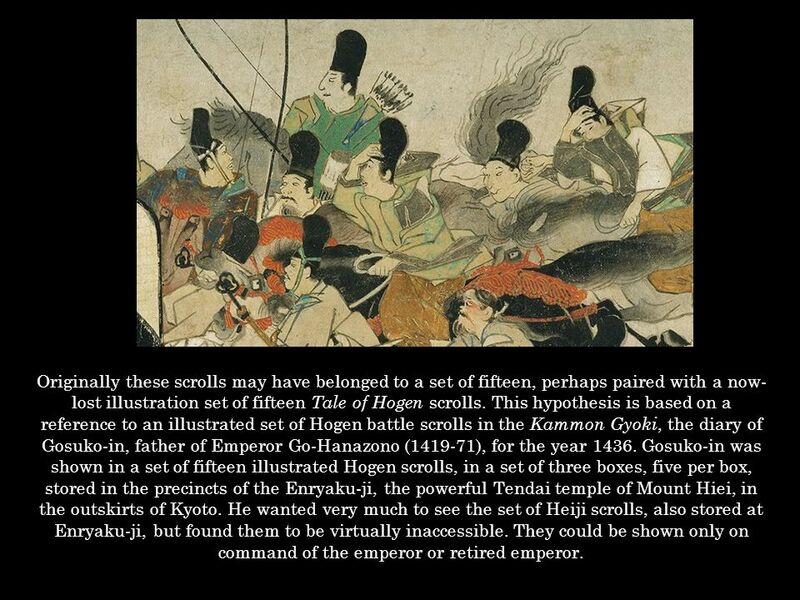 This hypothesis is based on a reference to an illustrated set of Hogen battle scrolls in the Kammon Gyoki, the diary of Gosuko-in, father of Emperor Go-Hanazono ( ), for the year Gosuko-in was shown in a set of fifteen illustrated Hogen scrolls, in a set of three boxes, five per box, stored in the precincts of the Enryaku-ji, the powerful Tendai temple of Mount Hiei, in the outskirts of Kyoto. He wanted very much to see the set of Heiji scrolls, also stored at Enryaku-ji, but found them to be virtually inaccessible. They could be shown only on command of the emperor or retired emperor. 12 Illustrated Tale of the Heiji Civil War: Scroll of the Imperial Visit to Rokuhara, housed at the Tokyo National Museum Obviously, the action-packed story and dramatic style of the Heiji scrolls were well suited to the period of a rising warrior class, just as romantic, static scenes illustrating the Tale of Genji were appropriate for the last days of the courtier a century earlier. 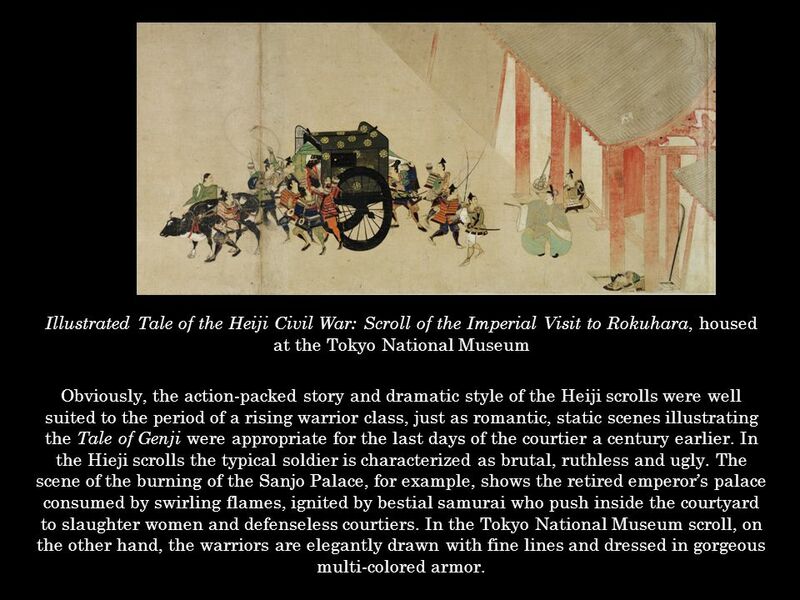 In the Hieji scrolls the typical soldier is characterized as brutal, ruthless and ugly. 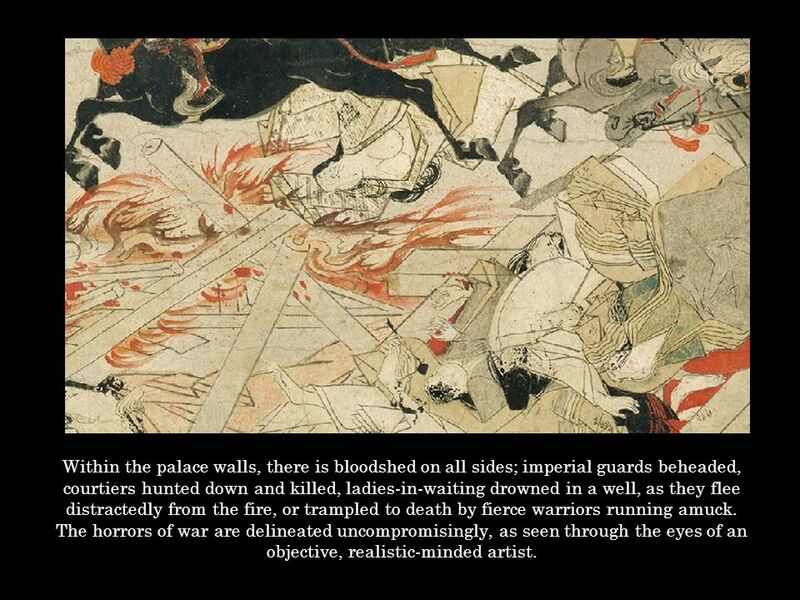 The scene of the burning of the Sanjo Palace, for example, shows the retired emperor’s palace consumed by swirling flames, ignited by bestial samurai who push inside the courtyard to slaughter women and defenseless courtiers. In the Tokyo National Museum scroll, on the other hand, the warriors are elegantly drawn with fine lines and dressed in gorgeous multi-colored armor. Meech, Julia. 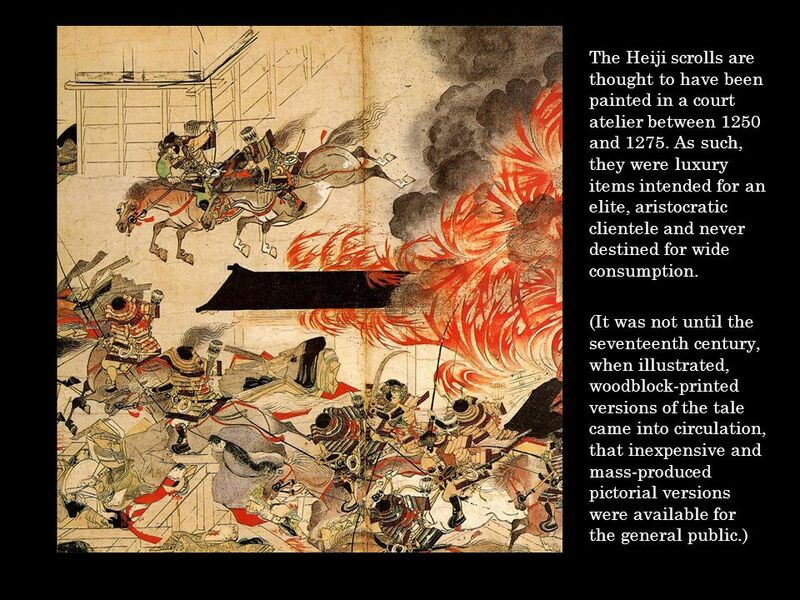 “Reflections on Fenollosa and the Heiji Battle Scrolls.” Orientations, Vol. 21, No. 9. Sept 1990. Meech, Julia. 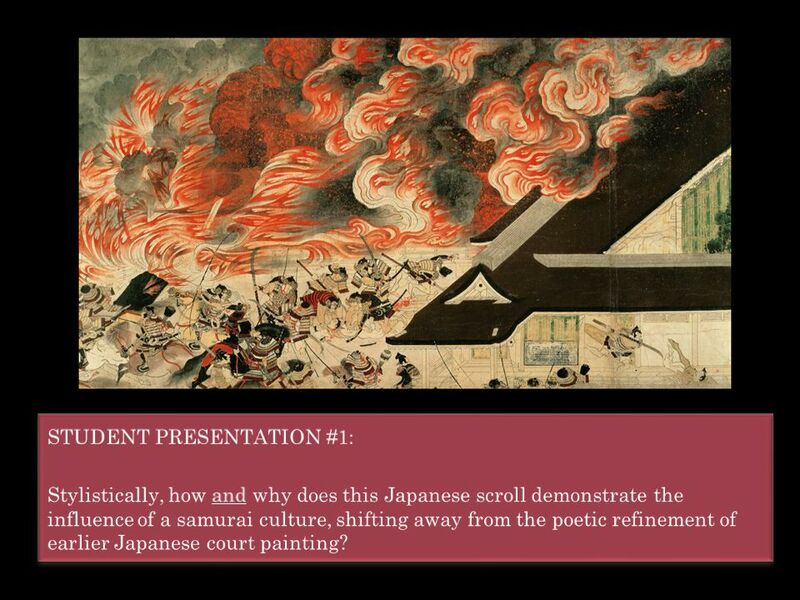 “Reflections on Fenollosa and the Heiji Battle Scrolls.” Orientations, Vol. 21, No. 9. Sept 1990. The shift in characterization from coarse villain to romantic hero may be due to the participation of a number of different artists working in a large atelier where labor was subdivided. In such studios, a supervisor would draw the basic outline but the color and details were finished by several assistants. 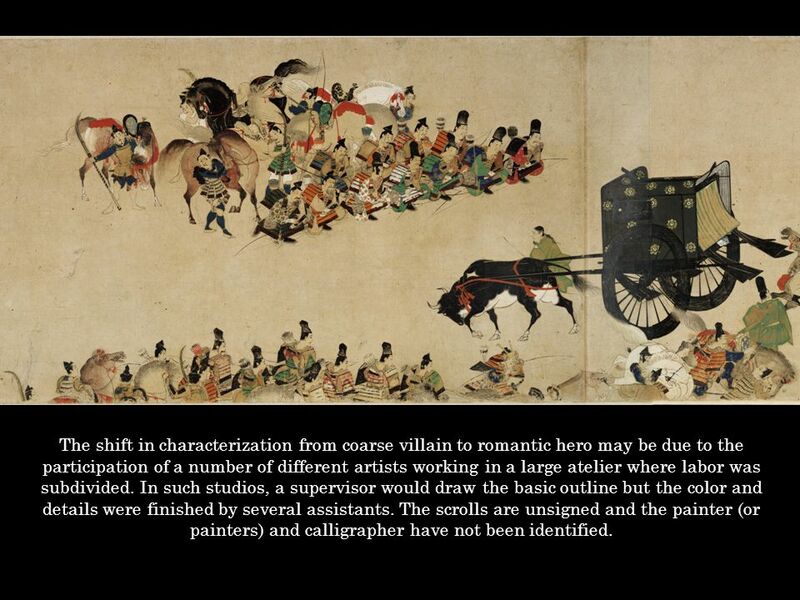 The scrolls are unsigned and the painter (or painters) and calligrapher have not been identified. Stylistically, how and why does this Japanese scroll demonstrate the influence of a samurai culture, shifting away from the poetic refinement of earlier Japanese court painting? 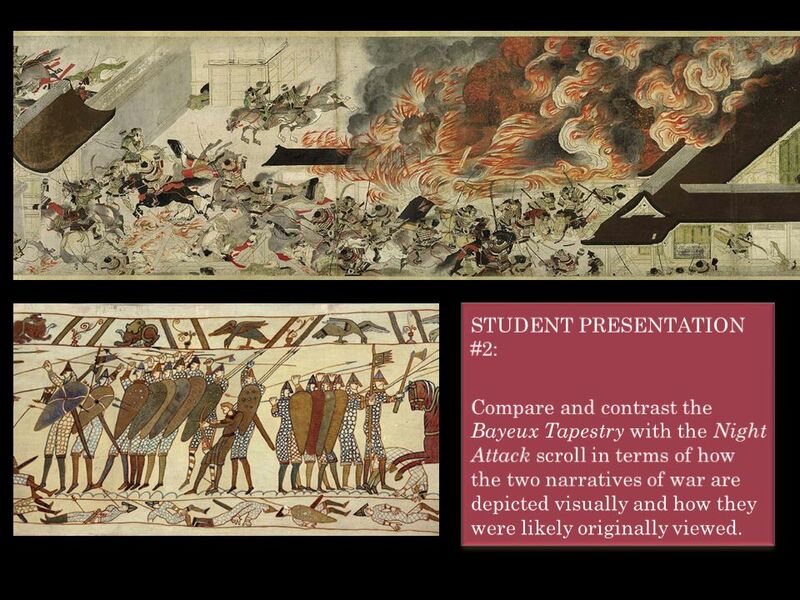 Compare and contrast the Bayeux Tapestry with the Night Attack scroll in terms of how the two narratives of war are depicted visually and how they were likely originally viewed. 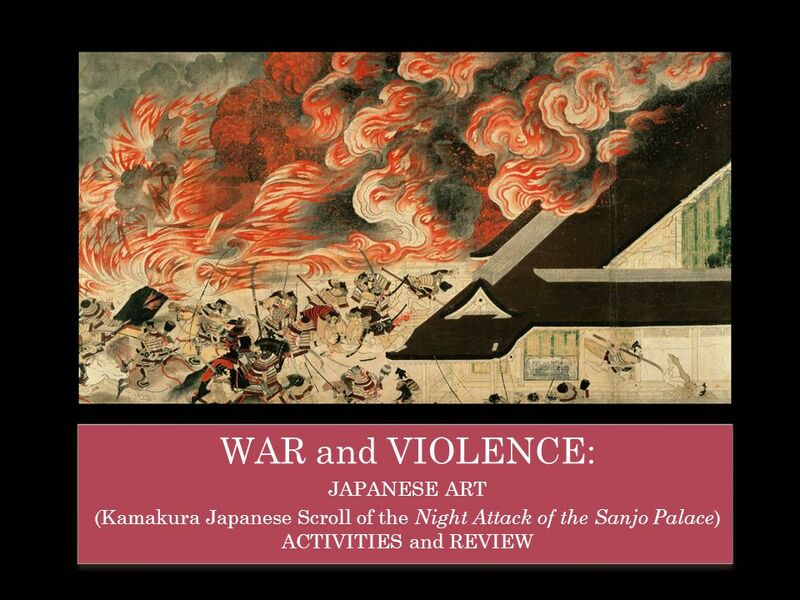 Download ppt "(Kamakura Japanese Scroll of the Night Attack of the Sanjo Palace)"
Terracotta Warriors By Drew Peltzman and Ariella Katz. SamuraiSamurai 侍 (those who serve). The Rise of the Samurai Mounted archers appeared in early Japan are regarded as ancestors of the samurai Mounted archers. By: Daeshaun Thompson. In the Japanese Feudal system the Shogun ruled over the Daimyo who were head of the samurai. Peasants were farmers with little. Feudal Japan Mr. Millhouse AP World History Hebron High School. Section 2 and 3 Questions 1.During the Nara period, the emperor’s power came from his control of the land & its ________. 2.Around A.D. 500, the _________. REPRESENTATIVE EARLY EAST ASIAN ART: JAPAN EUGENIA LANGAN MATER ACADEMY CHARTER HIGH SCHOOL HIALEAH GARDENS, FLORIDA. Japanese Art: Shodo Calligraphy There are 3 styles which range from very precise to very free-form Ink is made from charcoal and water Brushes are made. Art of the FAR EAST Chapter 5. … about 3,ooo B.C. the Chinese culture began to emerge half a world away from Egypt. Egypt CHINA. Introduction Beginning with the Sino-Japanese War in and the Russo-Japanese War in , the place of Japan in the world changed. Analyze the. Analysing Sources on Harold’s Death, 1066 By Mr RJ Huggins.